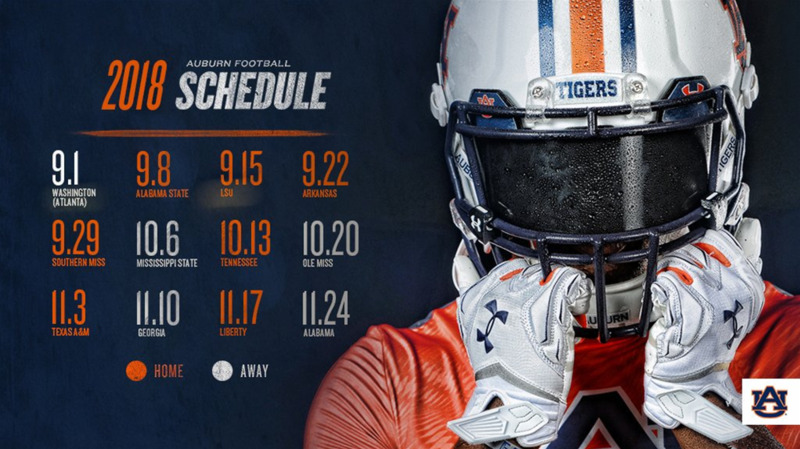 Come watch the 2018 Auburn Tigers Football Team as they take on Southern Miss on Saturday, September 29, 2018 in Jordan-Hare Stadium in Auburn, Alabama. During Auburn University home football games, Tiger Transit runs special game day routes. These routes are available to all game day fans and are free of charge. Regardless of the scheduled start time of the game, buses begin picking up fans at 4 hours prior to kick off, offer limited service throughout the game and continue returning fans to stops for 2 hours after the conclusion of the game. More info. Kick off home game weekends at the Friday Football Luncheons. Enjoy lunch with Auburn fans and preview the game with Coach Malzahn or other members of the coaching staff. Tickets are now available on aubtix.com. Join the War Eagle Girls and Plainsmen on Friday afternoons before home games beginning at 4 from the Auburn Alumni Center for a special tour of campus. Free and open to the public. Campus walking tours available prior to each home game. Join us on gameday Fridays for Football, Fans and Feathers at the Auburn University College of Veterinary Medicine's Southeastern Raptor Center. Tickets are $5 per person and include a raptor show, flight demonstration, and educational program. The event is held on Fridays before each home football game, at 4 p.m. on the Southeastern Raptor Center campus.